For a few weeks we have discussed helping those in the world who suffer hunger and starvation. It seemed a good idea to join with other churches in Pittwater to raise some money for World Vision’s 40 hour famine. This “ Pittwater Famine Village” is being co-ordinated by Mark Corbett-Jones, Director of Ministries at St. John’s Anglican Church in Mona Vale. The aim is to raise $100,000 through the efforts of Pittwater community to help the hungry people of Malawi. 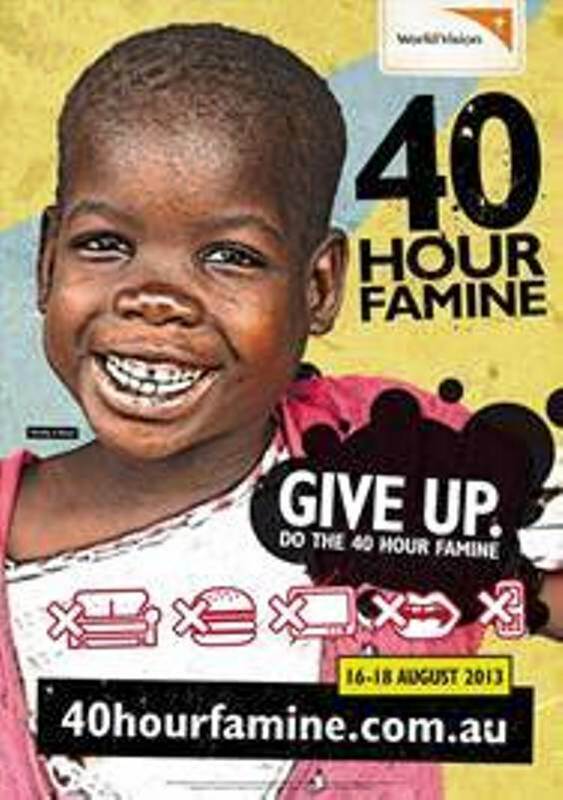 The 40 hour famine will be held from 16th to the 18th of August. So far 12 churches in Pittwater are involved. Our church is small in number, but even a small donation would help. For example $40 will feed a family of 6 for a month. Even a donation as small as $2 would help and is acceptable. There is no need to think of this action as being only for teenagers. Also It is not essential to fast for 40 hours, unless you want to do so to identify with the hungry. Some other suggestions are attached. Another option is simply to donate a few dollars to add to our contribution. or you can donate to support/ sponsor one of our team and enter your donation under that person’s efforts. Team so far :Richard, Mary, Lucy, and Kath. Richard will also be involved with Pittwater High School’s contribution . It would be so encouraging if MORE of our church family or friends joined the Avalon Baptist team (you can do that on the website). Please let me (Kath) know if you are joining the team . Donations can be made online and receipts are issued. Your supporters can donate online, or give you cash or cheque. It is OK to turn that cash into an online donation by using your bpay or your credit card. However we will also collect cash donations into a total amount and bank them at the end of the period. If you decide to join the team let me (Kath) know and I will give you a WV receipt book (so that you can give donors receipts for cash ) The famine ID numbers are needed on the receipts, yours ( if you register as part of the team), or that of the team leader (Mark) or the team member you are supporting. I will let you know the ID and Bpay numbers of other members of the team soon. NOTE TO TEAM MEMBERS= PLEASE REGISTER AND LET ME KNOW YOUR FAMINE ID.